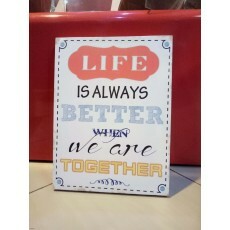 “Life is better is always better when we are together plaque is beautiful”, and at times it’s used to express love. Artists are special people in that, they can express feelings through decorative plaques or arts, send out a message or better still express the beauty of nature, artifacts or people to the whole world. Currently, canvas plaque has been taken to a higher notch. Technology has been a great eye-opener to many people, who now eye painting as a way of decorating houses. In the ancient times, people would use sand to decorate their house walls, but now technology has given people more ideas of how to use customized plaques to add a touch of beauty in their houses without having to damage the walls. This is through a canvas, a very durable and beautiful woven fabric, which many people may have valued less for quite a long time.